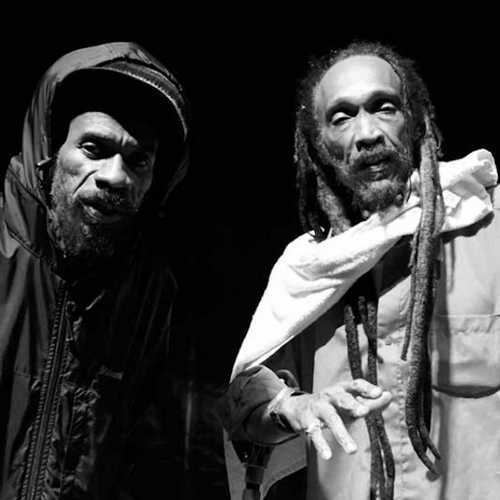 The duo Cecil “Skelly” Spence and Lascelles “Wiss” Bulgin form Israel Vibration since the departure of third member Albert “Apple” Craig in 1997. When they started their career in the mid-70s, they were part of a group of harmony vocal groups like The Abyssinians, The Congos, and Culture, who brought roots reggae music markedly in the cultural Rasta tradition. Even when the heydays of roots reggae came to an end due to the fact that dancehall music became the next craze in Jamaica’s popular music, Israel Vibration — whether as duo or trio — continued to uphold the Rastafarian tradition in exemplary fashion throughout as can be witnessed on albums such as “IV” (1993) “On The Rock” (1995), “Pay the Piper” (1999), Jericho (2000), “Fighting Soldiers” (2003) and the 2007 released “Stamina” set. 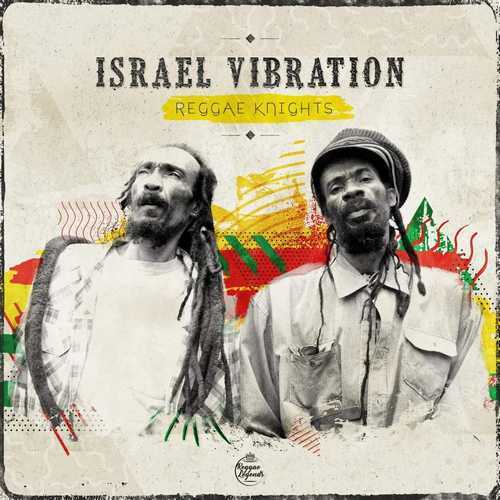 Whilst not really breaking any new ground, this dbl LP entitled “Reggae Knights” (originally released in 2010 on CD only) remains largely true to both the spiritual and musical values heard on their previous releases. Except for the dancehall flavoured “Original Gangster”, the only real weak tune around and surely not fitting the mood and vibe of this album, this set fully expresses their time-honoured preference for original, ‘live’ played riddims, stirring horn arrangements, and first-rate playing from musicians like the original Roots Radics members Flabba Holt (bass), Obeah (keyboard), Steve Golding (guitar) and Dwight Pinkney (guitar), Robbie Shakespeare, Dean Fraser, Nambo Robinson, and members of the Black Soil Band (backing band for Tarrus Riley). Besides that they’ve also engaged harmony singers like Nikki Burt, Sherida Smith and Althea Hamilton. All tracks were recorded at Jimmy Cliff’s studio (Sun Power Productions) and expertly mixed by Christopher Daley. The limited edition 180g dbl LP, released by French label Utopia based in Metz, kicks off in fine, very familiar style with the Skelly sung “My Master’s Will”, with the more ruff sounding vocal delivery of Skelly contrasting well with the sweetness of Wiss’ voice heard in the next song, the matching “Dig Up The Ground”. As usual both vocalists sing the tracks featured on the album alternately, which has proven to be a good formula as it brings in some variety in their albums. Most of the tracks are quality musical efforts, delivered in a way their fans are so familiar with and respect them for. As already pointed out this doesn’t go for “Original Gangster”, and also “New York City” (the place where Skelly and Wiss are living) with its country blues style riddim and the Mento flavoured “Cantankerous”, where they describe the perception of people of the island by the English colonists, can’t be placed amongst the best tracks of this collection. Remarkable to say the least is the do-over of the famous “Bad Intention”, which appeared in 1976 on the flipside of the “Why Worry” single. This song never appeared on an album before. Conclusion All in all a rock-solid effort with a lot of different musical directions.